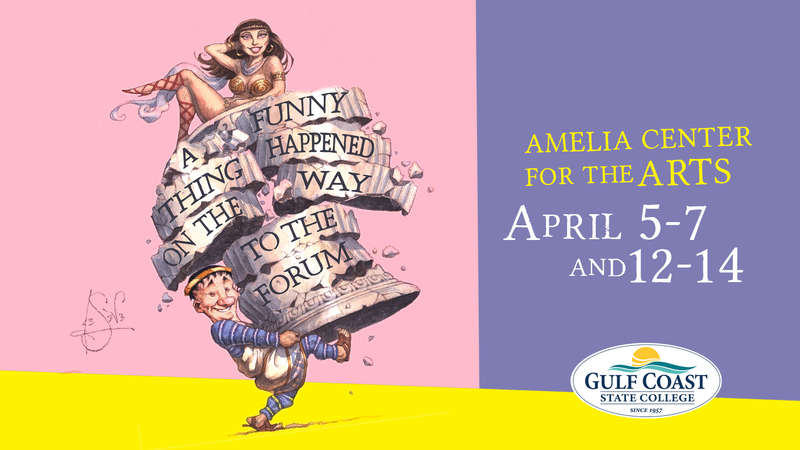 Panama City, FL – The Visual & Performing Arts Division at Gulf Coast State College is proud to present “A Funny Thing Happened on the Way to the Forum,” with music and lyrics by Stephen Sondheim and book by Burt Shevelove and Larry Gelbart. The cast consists of current GCSC students, alumni, local high school students and community actors including Christian Sullivan, Cooper Moore, Drew Rowell, Alex Watson, Tom Lovalgio, Amy Tinch, Jason Blanks, Christian Paris, Danyelle Alexander, Matthew Swanson, Dylan Van Slyke, Alexander Seeley, Mia Salaveria, MacKenzie Cady, Madi Falls, and Piper Streichert. The classic musical farce won Tony Awards for Best Musical and Best Author (Musical), and this production also features the actual costumes from the 1996 Broadway show, rented from Costume World Theatrical. The production is directed by Hank Rion, Assistant Professor of Theatre, and musical direction by Carissa Hosea, Associate Professor of Music and John Divine, Assistant Professor of Music, with set design by Brian Baillif, Assistant Professor of Theatre, and lights by Erica Burger Baillif, Technical Coordinator. All performances will be held in the Amelia Center Theatre on the Main Campus. Friday and Saturday evening performances will be held April 5 & 6, and 12 & 13 at 7:30 p.m.
Sunday matinee performances will be held April 7 and 14 at 2:30 p.m.
General admission tickets are $20 and $10 for high school students, seniors and military. Advance tickets may be purchased at www.gulfcoast.edu/arts. GCSC and FSU PC students, faculty and staff are admitted free with a valid ID. This entry was posted on March 18, 2019 by 850music in Posts and tagged press release.